The summit - the first between a sitting US president and the North Korean leader - will mark a turnaround of relations between Trump and Kim after a long-running exchange of furious threats and insults. On the eve of a historic summit between US President Donald Trump and North Korean leader Kim Jong-un in Singapore, UN Secretary General Antonio Guterres said that peace and verifiable denuclearisation of the Korean Peninsula must remain the clear and shared goal of the meeting. The UN chief hoped that diplomatic processes underway will pave the way for progress on human rights issues in Pyongyang. The UN Chief said as the US and North Korea meet, ups and downs, moments of disagreement and tough negotiations will be inevitable. He commended leaders of both sides for seeking to break out of the dangerous cycle that created so much concern last year. “Peace and verifiable denuclearization must remain the clear and shared goal. As I wrote to both leaders last month, the road ahead will require cooperation, compromise and a common cause,” he said. 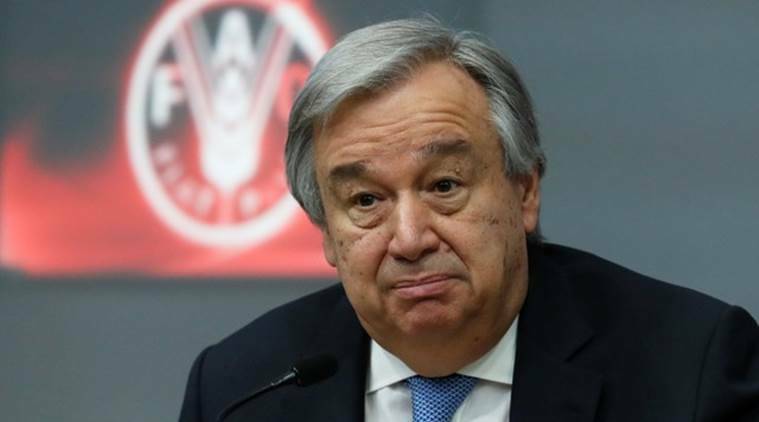 Guterres said going forward, he would urge attention to the humanitarian situation in North Korea, where USD 111 million are being sought to meet the immediate needs of six million of the most vulnerable people. “The people of the DPRK need our generosity and help. It is also important that diplomatic processes pave the way for progress on human rights issues, from family reunions to engagement with international mechanisms,” he said expressing hope that all parties will seize the opportunity to support a peaceful, prosperous, secure, and verifiably denuclearised Korean Peninsula. Assuring the UN system’s readiness to support the process in any way, including verification if requested by the key parties, Guterres said the Comprehensive Nuclear-Test Ban Treaty Organisation could also play an important role in monitoring the DPRK’s announced moratorium on nuclear explosive tests. He added that the Security Council has consistently underlined its desire for a peaceful, diplomatic and political solution to the situation, as well as urging further work to reduce tensions. The summit – the first between a sitting US president and the North Korean leader – will mark a turnaround of relations between Trump and Kim after a long-running exchange of furious threats and insults. The summit could lay the groundwork for ending a nuclear stand-off between the two countries and see Pyongyang dismantle its arsenal in return for economic help and security guarantees.